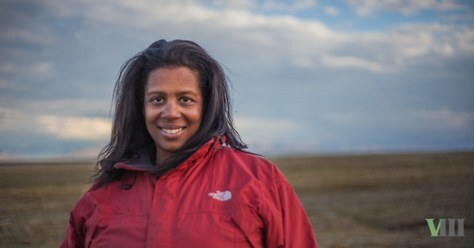 We Are The Arctic, published by Braided River/Mountaineers Books, highlights voices in favor of protecting the Arctic National Wildlife Refuge, including that of Rue Mapp, founder of Outdoor Afro. From Olympus to Everest, the thrill of the road less traveled has literally taken Mountaineers' members to the peak of possibility. Our organization has a long history of exploring nature’s wild unknown, and now we're doing our best to protect what's left of it. Spanning 19.6 million acres in the far northeastern corner of Alaska, the Arctic National Wildlife Refuge is a safe haven for wildlife, the ancestral home of the Gwich'in people, and one of the last places you can actually "get off the grid." Globally, its preservation serves as a counterforce to climate change. Despite this, the fight to protect it from oil drilling has persisted for over fifty years. In 2016, Mountaineers Books had the honor of publishing We Are The Arctic. The book's diverse voices and poignant images bring the region to life, inviting readers to join the call for its permanent protection. The following essay from Rue Mapp, founder of Outdoor Afro, captures her reflections from her first visit to the Arctic. "Just over a year ago, I unpacked my waterproof bag, which was filled with all the gear essential for the spectrum of summer conditions in the Arctic National Wildlife Refuge. Quite frankly, I am still unpacking that experience and sharing with others what it meant to spend nearly a week in one of the wildest and most remote places in the world— especially in the context of the work I do leading and inspiring Outdoor Afros around the country to engage with nature. The wilderness as I experienced it in the Arctic is a system of immeasurable strength and resiliency. It was an honor to step out of my illusion of control and to know a type of dependence and fragility found only in the remote wild. I know I am better for it." The Arctic Refuge – unique in its vast expanse of uncharted lands – represents one our last and greatest connections to this spirit of adventure. Your voice can make a difference: visit www.WeAreTheArctic.org and sign the petition. Read the rest of "We Are The Arctic" free online. About the Author: Rue Mapp founded Outdoor Afro as a blog in 2009; since then it has grown into a national organization that connects people, especially from the African-American community, to nature and the benefits of spending more time outdoors.